If you’re looking for a tiny home that doesn’t skimp on luxurious features, feast your eyes on the elegant Greenmoxie Tiny House on wheels. This comfortable, eco-friendly home is a 340-square-foot sustainably built dwelling that offers 100% off-the-grid living and even an electric drawbridge-style deck for enjoying the outdoors. 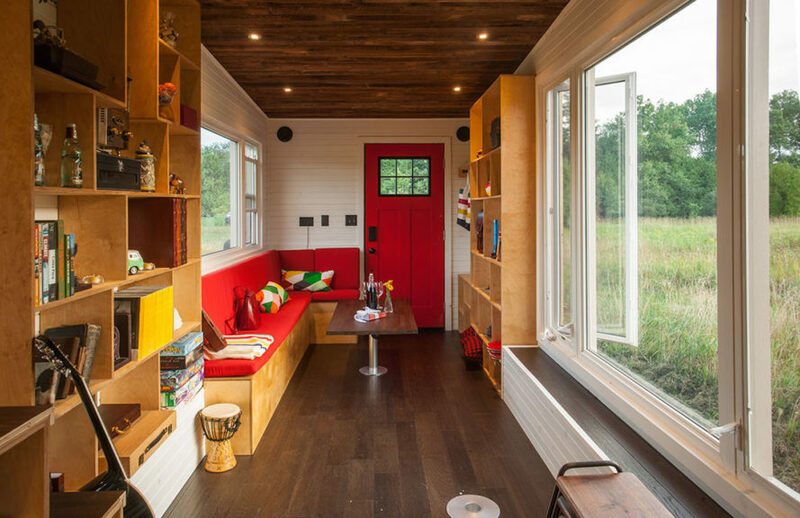 Upcycled materials, renewable energy systems, and its small footprint help reduce the Greenmoxie Tiny House’s environmental impact, while allowing homeowners to live large in a small space. Built like a cozy cabin, the Greenmoxie Tiny House features wood frame construction with handsome Shou Sugi Ban cedar siding sealed with linseed oil, hardwood oak flooring, a V-match pine interior, and reclaimed barn wood ceilings. A corrugated black metal dual-pitched roof topped with solar panels and a clerestory window lets natural light and ventilation in, as do the reclaimed modern windows that punctuate all four facades to frame views of the outdoors. The light-filled interior includes a spacious kitchen with a 24-inch range and propane refrigerator/freezer; a bathroom with a full-size stand-up shower, sink, and composting toilet; living area with a couch and multifunctional furnishings that double as storage; and a loft bedroom accessible via a storage-integrated staircase. The tiny home and its energy-efficient appliances are powered by a 1kW solar PV system with 11kW of stored energy capacity. Water is collected using a 200-liter rain barrel and is conserved and reused using a combination of tools including a water recovery system, home drinking purifier, and gray-water holding tank. Spray foam insulation—an R35 roof, R22 walls, and R35 floor—and a heat recovery ventilator system help maintain stable and comfortable indoor temperatures. In winter, the home is heated using a Dickinson 9000 propane heater and a wood-burning stove. The off-grid Greenmoxie Tiny House base model starts at $65,000 USD. Starting at $65K? How is that mortgage free? Are there people who actually have money like that just sitting in their bank accounts? I get minimalism, I have lived in a yurt with my 2 youngest children, a cat and a dog. I don't get the rich people tiny house trend. If I had 65K I could buy a verry nice home with property around here, furnish it, and have solar panels, a sustainable organic garden big enough to feed my family.. and ohh yeahh.. there would be room enough for my kids to play inside in the winter, and for us to get out of each other's hair in separate rooms. I'm guessing that the people who buy these things aren't actually spending much time inside them. I imagine they have to live near cities for their jobs, and they probably work a lot, eat out a lot, and send their kids to tons of things away from home. To be truly sustainable, we need to be growing more of our own food than having it shipped from across the country. These houses on wheels just do not speak sustainability to me and I am fed up with hearing rich people talk about how much money they are saving by buying a box that costs 3X as much as a decent home around here. End rant. 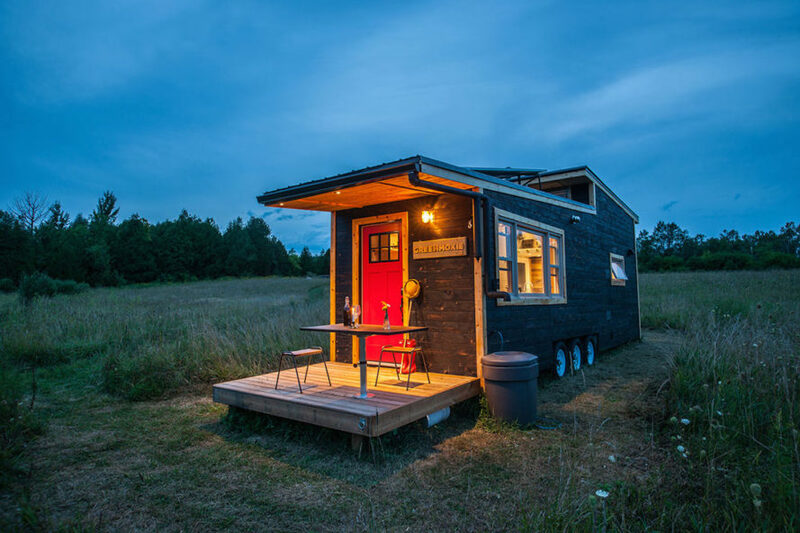 Built like a cozy cabin, the Greenmoxie Tiny House features wood frame construction with handsome Shou Sugi Ban cedar siding sealed with linseed oil, hardwood oak flooring, a V-match pine interior, and reclaimed barn wood ceilings. A corrugated black metal dual-pitched roof topped with solar panels and a clerestory window lets natural light and ventilation in, as do the reclaimed modern windows that punctuate all four facades to frame views of the outdoors. The light-filled interior includes a spacious kitchen with a 24-inch range and propane refrigerator/freezer. A bathroom with a full-size stand-up shower, sink, and composting toilet. Living area with a couch and multifunctional furnishings that double as storage. A loft bedroom accessible via a storage-integrated staircase. The tiny home and its energy-efficient appliances are powered by a 1kW solar PV system with 11kW of stored energy capacity. Water is collected using a 200-liter rain barrel and is conserved and reused using a combination of tools including a water recovery system, home drinking purifier, and gray-water holding tank. Spray foam insulation—an R35 roof, R22 walls, and R35 floor—and a heat recovery ventilator system help maintain stable and comfortable indoor temperatures. In winter, the home is heated using a Dickinson 9000 propane heater and a wood-burning stove.